Rosiglitazone is an orally active, thiazolidinedione (TZD), a class of antidiabetic drugs that acts as an insulin sensitizer. TZDs bind to the nuclear receptor transcription factor peroxisome proliferator-activated receptor gamma (PPAR-γ), forms a heterodimeric complex with retinoid X receptor-alpha (RXR-α), and binds to PPAR DNA response elements (PPREs) (Chandra et al., 2008). In the active state of the heterodimer, agonist ligands bind to PPAR-γ [e.g., one of the TZDs] and RXR-α [9-cis retinoic acid (9RA)] leading to binding of coactivator proteins (CoA in Figure 2), which in turn activate transcription of lipid-metabolism and insulin-responsive genes (Figure 2). Figure 2. 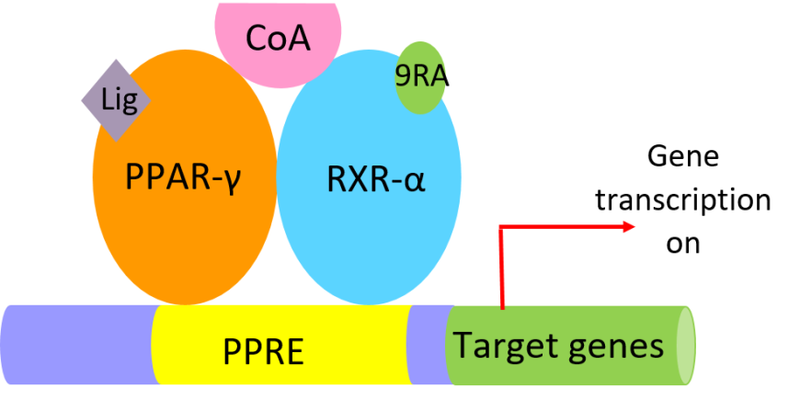 Cartoon representation of components of the PPAR-γ-RXR-α active complex bound to PPRE sequences activating insulin-responsive genes. Learn more about PPAR-γ here. The overall structure of the co-activator bound to PPAR-γ-RXR-α-PPRE in presence of rosiglitazone (PDB ID 3dzy; Chandra et al., 2008) is shown in Figure 3. 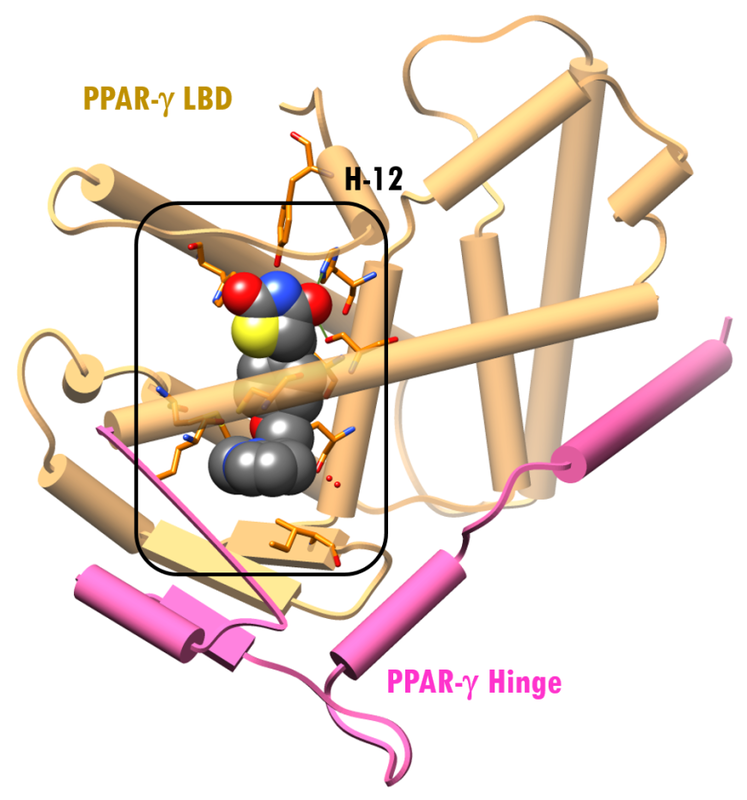 PPAR-γ is shown as red (DBD), pink (hinge) and orange (LBD) cylinders, RXR-α as blue (DBD), dark blue (hinge) and cyan (LBD) cylinders. The PPRE DNA is colored yellow, and coactivator motifs are shown as green cylinders. The ligand binding domain (LBD) forms the pocket for direct interaction with specific pharmacological and endogenous nuclear receptor ligands. 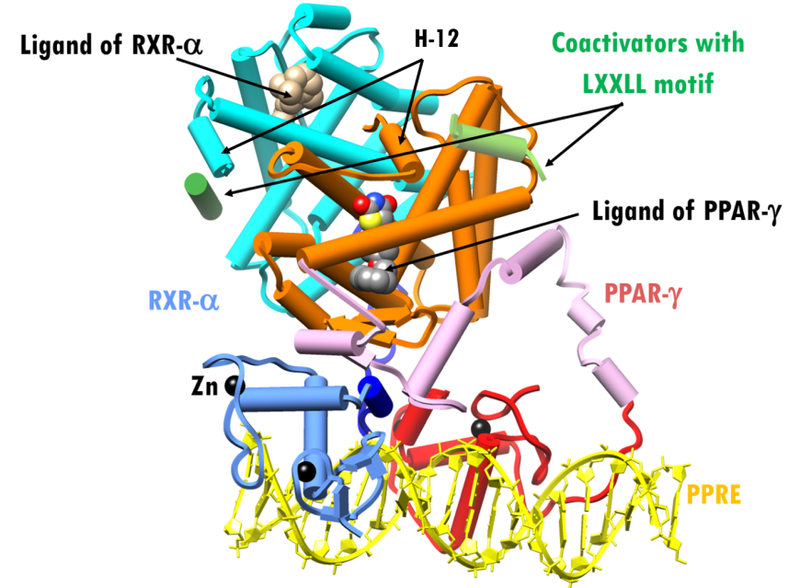 Ligand binding to the LBDs of PPAR-γandRXR-α repositions α-helix 12 (H-12 in Figure 3) in both receptors into the active conformation, thereby promoting the recruitment of coactivator proteins leading to the activation of lipid-metabolism and insulin-responsive genes. Figure 3. X-ray structure of PPAR-γ–RXR-α complex plus agonist ligands and coactivators bound to a PPRE (PDB ID 3dzy; Chandra et al., 2008). Representation and color coding: PPAR-γ cylinders and arrows, red, pink, orange; RXR-cylinders and arrows, blue, dark blue, cyan; RXR-α ligand space-filling beige; PPAR-γ ligand space-filling grey; Zn2+spheres black; coactivators cylinder, green. PPRE DNA ribbons and slabs, yellow. A structure of PPAR-γ LBD complexed with rosiglitazone, based on a recent and higher resolution structure (PDB ID 4ema, Liberato et al., 2012), shows that the ligand binding site is quite large (Figure 4a). Consequently, this site/pocket can accommodate a wide range of structurally diverse ligands. Figure 4a: X-ray structure of PPAR-γ LBD-Rosiglitazone (PDB ID 4ema; Liberato et al., 2012). Representation and color coding: PPAR-γ cylinders and arrows, pink, beige; rosiglitazone ligand space-filling color-coded by atom type (C: gray; N: blue; O: red; S: yellow). Figure 4b: The surface of the active site of the LBD of PPAR-γ is shown in violet. Rosiglitazone is shown in a ball-and-stick representation, color-coded by atom type (C: gray; N: blue; O: red; S: yellow). Residues within 4.0Å of rosiglitazone are shown as sticks (PDB ID 4ema; Liberato et al., 2012). The PPAR-γ ligand binding site has a mix of polar and non-polar residues, with one end being hydrophobic and the other hydrophilic. Figures 4b shows a close-up view of this surface with bound rosiglitazone and amino acid residues within 4.0Å (illustrated in stick figure representation.) Rosiglitazone assumes an arc-shaped conformation around the central benzene ring at the binding site. The pocket near the H-12 helix is composed of polar residues, Ser289, His323, Tyr327, His449, and Tyr473, while the other end of the pocket is lined with non-polar residues like Ile281, Leu330, Ile341 and Met364. The thiazolidinedione group of the drug faces Tyr473, His323 and His449 and is positioned to form hydrogen bonding interactions with PPAR-γ residues Ser289, His323 and His449 (PDB ID 4ema, Figure 5). The pyridylamino group occupies a pocket lined by hydrophobic residues Ile281, Cys285, Leu330, Ile341, Met364, (Figure 5). 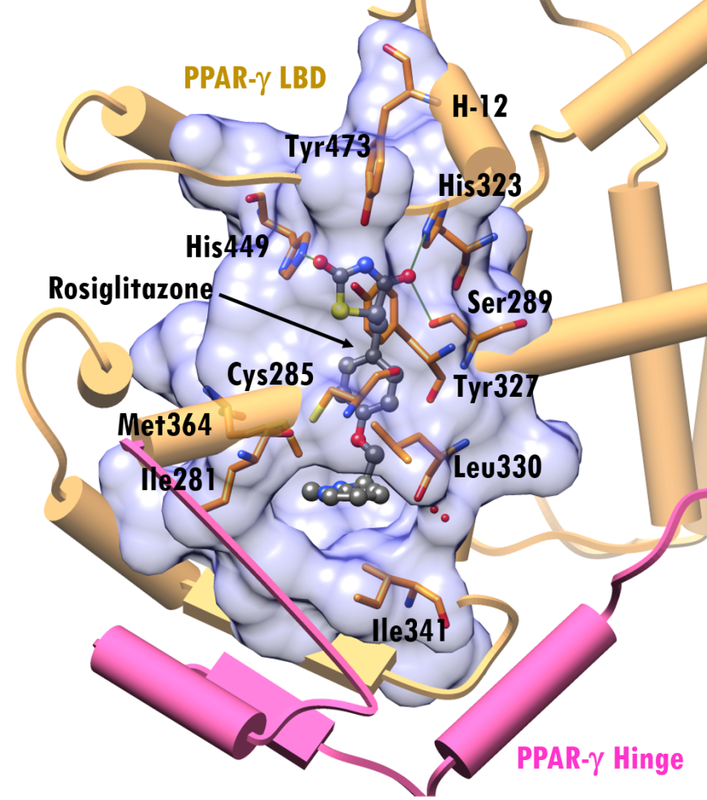 Binding of agonist ligands, like rosiglitazone, to PPAR-γ reposition α-helix 12 of the receptor, thereby promoting the recruitment of coactivator proteins which ultimately triggers transcription. Liver injury due to rosiglitazone is rare. No clinically significant differences are observed when rosiglitazone is administered with or without food. After drug administration, it takes approximately one hour to observe its peak plasma concentrations. Duration of action depends on the patient’s metabolism, but oral clearance is 3.03 ± 0.87 L/hour. It is metabolized in the liver into inactive metabolites via N-demethylation, hydroxylation, and sulfate and glucuronic acid conjugation. In vitro studies have shown that cytochrome (CYP) P450 isoenzyme 2C8 (CYP2C8) is the principal contributor to hepatic metabolism of rosiglitazone (Baldwin et al., 2001), while CYP2C9, CYP1A2, CYP2E1, and CYP3A4 make minor contributions. When taken concomitantly with other anti-diabetic medications, dosing may need to be adjusted, especially if hypoglycemia occurs (DrugBank). Inhibition studies have shown that thiazolidinediones (TZDs), including rosiglitazone, are strong inhibitors of CYP2C8 and CYP3A4, and these results suggest that TZDs at high doses have the potential to cause clinically significant drug-drug interactions with CYP2C8 substrates (Sahi et al., 2003). Rosiglitazone is a non-carcinogen. According to the National Institutes of Health, clinical trials showed that clinically apparent liver injury attributed to rosiglitazone is rare. In June 2007, a study published in the New England Journal of Medicine by independent researchers documented that Avandia increased heart attack risk by 43% (Nissen and Wolski, 2007), inducing in the US FDA to require strong warning labels on all TZD medications. This finding led to the UK, India, New Zealand, and South Africa to withdraw marketing approvals for Avandia. After multiple studies, senate hearings, and clinical trials, all restrictions and warning labels were removed in November 2013 following release of data from the Rosiglitazone Evaluated for Cardiac Outcomes and Regulation of Glycemia in Diabetes (RECORD) study. This large, randomized trial, sponsored by GlaxoSmithKline and performed in 2008, showed that metformin–sulfonylurea (control) and rosiglitazone therapy had similar rates of cardiovascular-related complications and mortality (Drugs.com). Baldwin, S.J., Clarke, S.E., and Chenery, R.J. (2001). 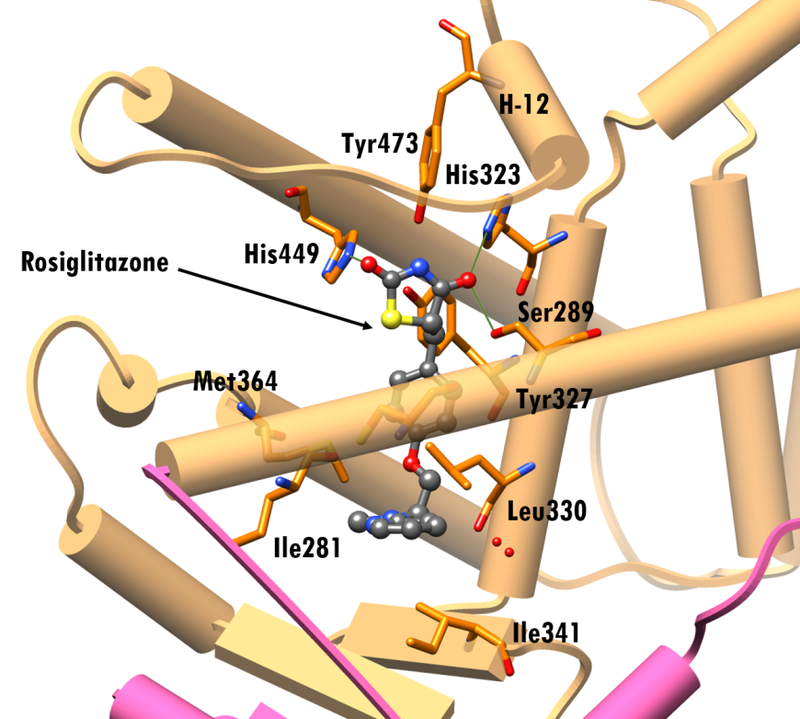 Characterization of the Cytochrome P450 Enzymes Involved in the in vitro Metabolism of Rosiglitazone. British Journal of Clinical Pharmacology, 48, 424-32. doi: 10.1046/j.1365-2125.1999.00030.x. Chandra, V., Huang, P., Hamuro, Y., Raghuram, S., Wang, Y., Burris, T.P., and Rastinejad, F. (2008). Structure of the intact PPAR-γ–RXR-α nuclear receptor complex on DNA. Nature, 495, 350-356. doi: 10.1038/nature07413. Liberato, M.V. Nascimento, A.S., Ayers, S.D., Lin, J.Z., Cvoro, A., Silveira, R.L., Martínez, L., Souza, P.C., Saidemberg, D., Deng, T., Amato, A.A., Togashi, M., Hsueh, W.A., Phillips, K., Palma, M.S., Neves, F.A., Skaf, M.S., Webb, P., and Polikarpov, I. (2012). Medium Chain Fatty Acids are Selective Peroxisome Proliferator Activated Receptor (PPAR) γ Activators and Pan-PPAR Partial Agonists. PLoS ONE, 7, e36297. doi: 10.1371/journal.pone.0036297. Rosiglitazone (2016). National Institutes of Health. Retrieved June 18, 2016, from http://livertox.nih.gov/Rosiglitazone.htm. Rosiglitazone (2015). Drugs.com. Retrieved June 18, 2016, from http://www.drugs.com/mtm/rosiglitazone.html. Rosiglitazone (2005). DrugBank. Retrieved June 18, 2016, from http://www.drugbank.ca/drugs/DB00412. Rosiglitazone (2015) Santa Cruz Biotechnology. Retrieved June 18, 2016, http://www.scbt.com/datasheet-202795-rosiglitazone.html.